I met with Cheryl Urquhart (Land manager) and Jeremy Smith from Berkeley first (developers) and Hayley Ellison from TP Bennett (architect planning consultant). We had a very interesting discussion about the modifications of the initial scheme and the outcome of the consultation. 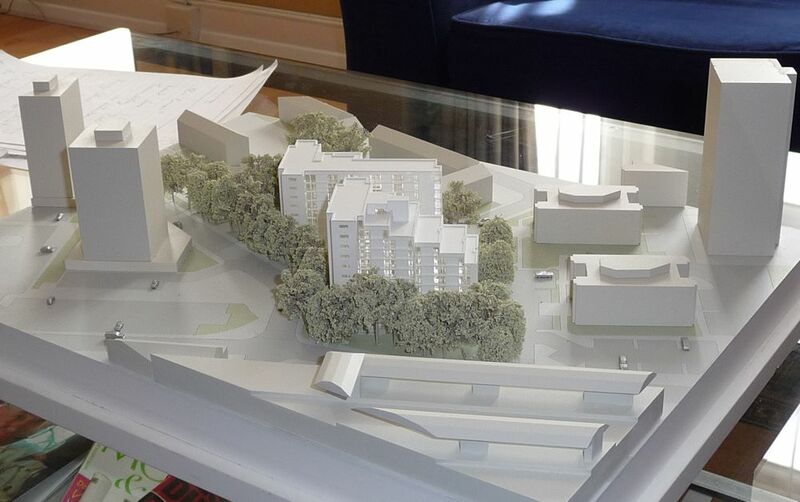 I initially presented the application for the redevelopment of the site along Grant Road to provide 452 self-contained studio rooms for use as student accommodation (for post-graduate students of Imperial College London) on an article HERE. The purpose of the meeting was to meet with the developers, have information on the scheme and let them address the concerns raised by some local residents. The original scheme was granted planning permission last year for residential. On this new application the height of the building is very similar, however there is 1 extra floor as the room heights are less with student accommodation than with normal residential. The small foot print reduction is due to the shape of student rooms, all standard 20 sq. meters (7×3). In addition, the initial car park was removed and used for other facilities and cycle storage. A public exhibition was held for the new scheme on 4th June and 6th June, attended by 6 people in total (2 from the Battersea Society). Concerns were expressed for the trees. Developers have confirmed that the scheme is not removing trees surrounding the site, mostly protected. They will be removing some category C (not good quality) within the construction site. Regarding the issue on parking 2 spaces are reserved for maintenance/security, 2 “car club” and 2 4 for disable spaces. The developers don’t believe that there should be any incentive to have a car: there will be 226 cycle parking in the basement. There is currently no CPZ (controlled parking zone) for the area (except on Grant Road), but it was specified that should the Council put one in place, there will be no right for residential parking given to the residents of the development. An additional argument is that any additional car space would involve removing more trees and could encourage residents to bring cars. They can give the example of the development in Borough (for Kings College), a similar scheme already occupied, where there is no parking (except for disables – but not in use apparently) and no disturbance. In addition it was said that any disable will be primarily located inside the campus in South Kensington. Concern about possible impact on the adjoining site 50 Winstanley Road (vacant Children’s Home). The building appears tall on this corner and objectors would prefer to have the bay omitted. Lack of parking space and loss of trees (the developers responded in our discussion above). Decrease of natural light for surrounded residents. Increase in demand for local services from 450 residents. Opposition of the occupiers of the current site. Buildings to high and out of proportion (need to reduce the scale as Winstanley Estate is a ‘mixed height area’ not a high-rise only estate). Increase in noise, traffic and disturbance (answer is provided by the developers as they gave the example of an existing site above). No provision was made on the buses as study shows that there is enough capacity available on those routes. In addition, students will be using public transport off-pick or essentially out of congestion time, therefore not creating pressure on the train/buses. Last but not least, I was requesting more photo-montage/models to assess the impact on the zone. They came with the scale model of the development as you can see on the 2 photos below (click to enlarge). People can submit a comment using the form here, or write to the Council (addresses here with reference 2009/2279). Thank you for taking the time to meet with us yesterday. I have read through your report and just have a couple of comments, which perhaps you could include in the article. Just for completeness – I am a planning consultant (rather than the architect) and the scheme incorporates 4 rather than 2 disabled car parking bays. With regard to the comments made by residents to date, as we discussed the overall bulk and mass of the proposed building is less than the scheme that was approved last year. The height of the buildings remains the same, but the footprint has been reduced. With regard to the proximity of the buildings to the adjacent property at 50 Winstanley Road, the footprint of the nearest building has been moved further east (in comparison with the approved scheme) so that the building would actually be situated further away from the vacant Children’s Home. I hope these comments help. If you have any further queries, please do not hesitate to contact us. Thanks for updating your article. With regard to the application and representations from local residents, we are monitoring the responses received by the Council to ensure we are aware of objections received. In terms of the current proposals, we have submitted a detailed planning application which assesses the potential impact of the proposed scheme in terms of planning, design, highways/transport, air quality, acoustics, trees, sustainability, daylight and sunlight, ecology and flood risk issues; reports covering all these matters accompany the application. Furthermore, the design of the proposed scheme maintains the height and reduces the overall scale of the development approved by the Council last year. Whilst we recognise that the proposals for student accommodation would result in a relatively modest increase in population above that likely from the residential development we consider that the assessments submitted with the application adequately address the planning issues and explain that the proposals are in accordance with planning policy. We have spent a significant amount of time discussing this scheme with planning officers and we undertook pre application consultation to consider people’s views. As we mentioned at our meeting, we always take care in our pre application discussions to ensure that by the time an application is submitted it has been negotiated to a point where it is fully justified and is not an opening gambit upon which negotiations commence. We think that the scheme proposed would be a high quality development that would positively enhance the area, including the public realm improvements which would be possible through the S106 contributions. We trust these points address your queries, but please do not hesitate to contact us if you have any further concerns. Thanks for your response. I will follow the case and let you know on any further issues/developments. Regarding you message below, I would like to comment on you saying “We have spent a significant amount of time discussing this scheme with planning officers and we undertook pre application consultation to consider people’s views. As we mentioned at our meeting, we always take care in our pre application discussions to ensure that by the time an application is submitted it has been negotiated to a point where it is fully justified and is not an opening gambit upon which negotiations commence“. Unfortunately, in WBC, current pre application discussion with the planning department cannot be self justification for turning down future amendments. However, as it seems that Berkeley as always been responsive and open to consultation I feel comfortable that all opinions will be considered.